It's holiday time down in Armadillo Acres and everyone's filled with warmth and beer. But when a freak bout of amnesia strikes the trailer park Scrooge, neighborly love is put to the test. 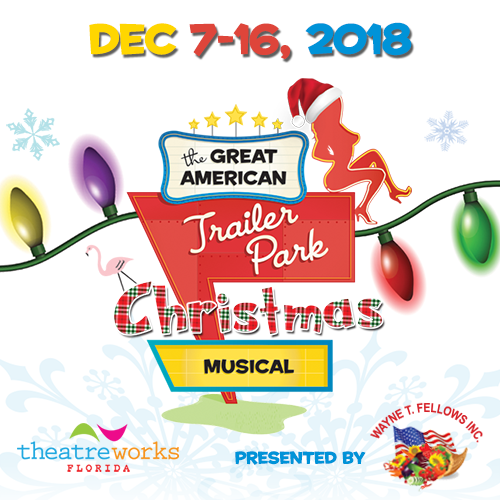 This outrageous sequel to the original THE GREAT AMERICAN TRAILER PARK MUSICAL is just as much of a cat-fightin', sun-worshippin', chair-throwin' good time but with Tinsel and Keg Nog! All shows are General Admission. Limited seating. Performances on Fridays @ 8PM, Saturdays @ 8PM and Sundays @ 2PM. Doors open 30 minutes prior to each performance. Accepted methods of online payment include MasterCard, Visa, American Express and Discover. Tickets are sent directly to your email. There is no Will Call service at this time. All sales are final – no refunds or exchanges. Disclaimer: Ticket prices, artists, performances, date & time are all subject to change without notice. GPS Address to TWF Theatre: 8 W. Palmetto St., Davenport, FL 33837. Need help? Please email [email protected] or call Abel Gonzales at 407.340.0473. Bring in your ticket stub for 15% off these great restaurants (valid to Dec. 30, 2018).